On the surface, motor gears appear to be reduced in size or quantity. This is in some ways true, such as in the case of a motor of a rotary machine where output speed is reduced and torque increased. Gear reducers are mostly used in this application to achieve the desired result. Gear reduction means the rotational speed of the rotary machine is reduced with a gear ratio greater than 1:1. It is accomplished when smaller gears with lesser number of teeth mesh and drive larger gears with more number of teeth. Its impact on torque is entirely opposite. The machine’s torque is increased when it is multiplied by the gear ratio. This is true in the case of generators in wind turbines, used to convert a slow speed of turbine blade to a higher speed needed to generate electricity. A common gear ratio used is 90:1, with 16.7 rpm input from the rotor to 1,500 rpm for the generator. 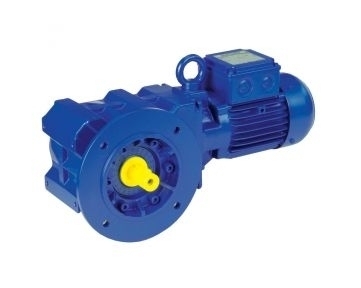 This particular application uses gearboxes which are assembled opposite to the regular use. The design of a wind turbine gearbox is quite challenging because of the loading and environmental conditions in which it operates. While the turbine rotor applies large forces to the wind-turbine drivetrain, torque from the rotor generates power. As such, it is very important to always make sure that the drivetrain isolates the gearbox effectively or that the gearbox is specially designed to support the loads. Otherwise, the internal components of the gearbox, particularly the gear reducers, will be severely misaligned, resulting in failures. Choosing the correct size and style of gear reducer is achieved by determining the specific requirements of the application. When it comes to materials, lightweight plastics are very efficient and you can ignore the efficiency rating in calculating the output torque. But for heavy metal gear reducers, used for critical applications such as in the wind turbine generators, the efficiency must be taken into account. Regardless of your unique application, Bauer GMC is the home of industry specialists in innovative and energy-efficient motor gears, including gear reducers. We are a well trusted source of high-quality, highly reliable geared motor solutions. Contact us today to learn more or to speak with an expert!